Born in the family of peasants in 1940 at Pamarru, Krishna District. Obtained Diploma in Fine Arts from Government of A.P. and graduated in English literature from Agra University. Worked as an Art Teacher from 1958 to 2000 in State and Central Government School. Experimented in Painting and Printmaking. Received Awards from Kalidas Samaroh, Ujjaini, Dasara Exhibition, Mysore, GDDM Association Berhampur, Chitrakala Parishad, Bangalore, Indian Academy of Fine Arts, Amritsar, Nashik Kala Niketan, Mahakoshal Kala Parishad, Raipur, Hyderabad Art Society, A.P. 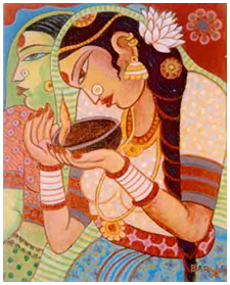 council of Artists; Bharat Kala Parishath, Andhra Pradesh Lalitkala Academy and from most of the Art Organisations of A.P. Stopped participation in competitive exhibitions in 1985. Received the Soviet land Nehru Award in 1984 along with Pandit Briju Maharaj and Ustad Bismalla Khan. Honoured with the National Award for Teachers, the C.C.R.T National Award for Teachers, the Balabandhu Title from A.P. Balala Academy, Pratibha Purashkar of the Telugu University, Varada Venkataratnam Memorial Award of the Rajahmundry Chitrakala Niketan, Andhrasri Award from Alluri Sitaramaraju Yuvajana Samithi, Rajahmundry and Sanskarp. Bharathi Puraskar of A.P. Chapter. He is the second Indian to receive the Coveted Sunny Medal ORDER OF SMILE from Poland first being Shri Shankar Pillai. The USSR Artists council, the world Art, Siovania, Children’s centers of Celji, Hungary, Macidonia, Finland & Skopje presented their Diplomas of Honour to him. The Ex-Libris, Slovakia honoured him with "Teacher of Great Success" Award. He had his solo exhibitions eight times at Hyderabad and one at the AIFACS Galleries, New Delhi. His works are seen in the important museums in India and a few abroad. He is the founder of "Young envoys International" a child art trust & "Sanskriti" Rural Art Center for children at Hyderguda Village, R.R.Dist. He is the editor of the quarterly magazine ART DRIVE and published 49 volumes of the same. He organized scores of art exhibitions creating activities for more than 25 lakhs of children and youth and awarded them with thousands of prizes. In his guidance 16 students won the Soviet land Nehru Awards and visited U.S.S.R as Indian delegates. 20 children received the National Talent Search Scholarships in painting given by the CCRT, New Delhi. His students received Hundreds of International Awards including Grand Prix Awards from Macidonia & Russia, Golden Palettes from Bitola, "Golden Horse" from the World of Art, Slovenia, Black Cat Awards from Torun, Poland, The Rose of Lidice Medals from Czech Republic, Gold Plaques from Japan, Gold Medals from Korea, Skopjee, Bulgaria latvia, Philippines, Portugal, Islamic Republic of Iran, Egypt, Silver leaf Awards from Berlin and so on. He took BAPU DARSHAN, the mobile exhibition of child art, reflecting the life and philosophy of Mahatma Gandhi, to 42 places in Andhra Pradesh and to Lalitkala Academy, New Delhi. 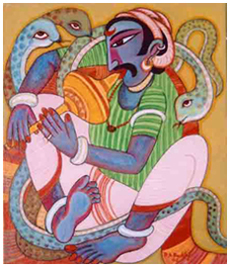 His services in different capacities were taken by most of the art organisations of Andhra Pradesh. At present he is engaged in providing art education to rural children.